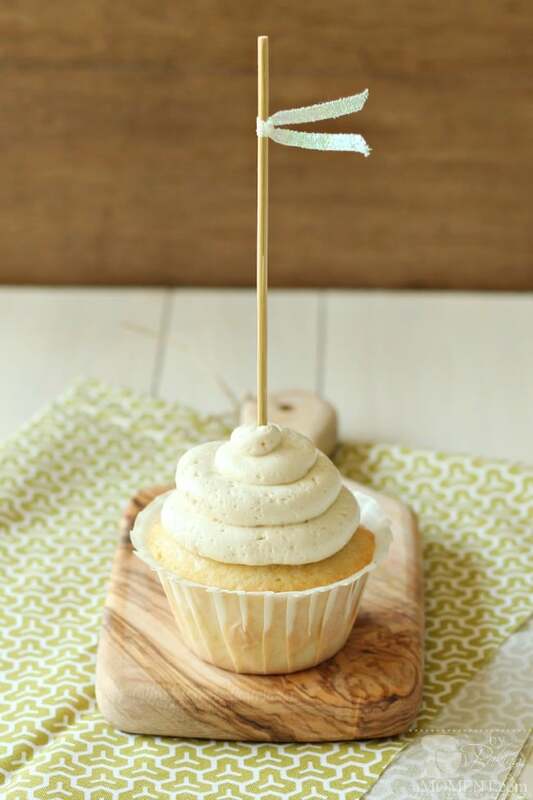 These Vanilla Cupcakes will be your absolute Favorite! So Fluffy, with an Intense Vanilla Flavor and Buttery Richness. They have a Fine, Even Crumb, and a Perfect Dome on top! They are Sturdy enough to stand up to all sorts of Fillings and Frostings, but I’ve kept it Simple with a Vanilla Swiss Meringue Buttercream. You’ll reach for this Recipe again and again! Guess what? I’ve reworked this recipe and come up with something even better! Go check out my Even Simpler, More Perfect Vanilla Cupcakes—-> here. I was so pleased when the people at Zulka reached out to me recently, and offered me a sample of their product. 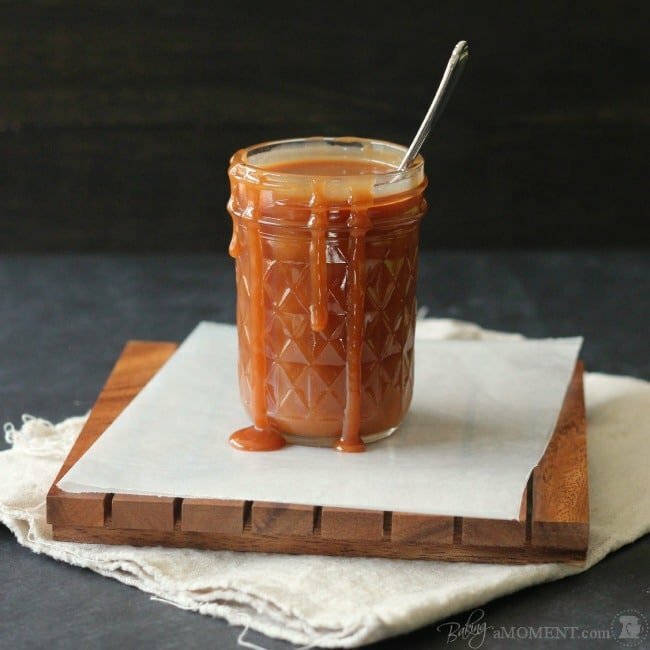 (If you aren’t already familiar, Zulka Morena Pure Cane Sugar is a less-processed, non-GMO version of the granulated sugar we already know and love.) 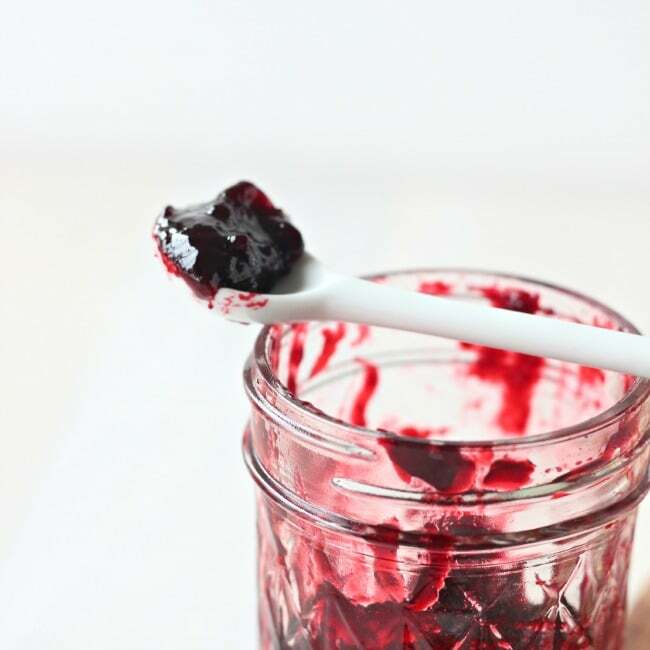 Since I am a huge lover of all things sweet, and ALSO of all things natural, I thought Zulka would be a great fit for me, this blog, and you, my readers! I knew from the start I wanted to bake up a recipe that really allowed the flavor of the sugar to shine through. Something simple and sweet, that would showcase this lovely product. Also, I was overwhelmed by the positive response to my Chewy Peanut Butter Cookies. It took me by surprise, that such a simple recipe was so well-received, and it got me thinking… maybe I should offer more tried and true basics on Baking a Moment? Kind of silly for me to assume that everybody already has their favorite standby recipes to reach for. So, today, I’m introducing a new category/recurring series here on Baking a Moment: “Simply Perfect.” I still want to offer you guys some clever and inventive ideas, but I’m also going to arm you with some seriously awesome building-block recipes too! These will be all my favorites, from years of practicing and experimentation! I hope you will enjoy them as much as I do…. Billy’s Vanilla, Vanilla Cupcakes (tasted great but had a hard crust on top), America’s Test Kitchen White Cake (pillowy soft and delicious, but too delicate), Dorie Greespan’s Perfect Party Cake, via My Baking Addiction (subbing vanilla bean paste), and My Favorite Vanilla Cupcakes, by Cookies and Cups, which was adapted from Back in the Day Bakery. Also I thought Shelly’s had a slightly richer flavor, which is probably because of the egg yolk. (But if you’re really going for a snowy white cake, I’d go with Jaimie’s.) And her recipe is so easy to throw together, with only a mixing bowl, paddle, and measuring cup to wash when all’s said and done. All of them were so very delicious though! I’ve only made one slight modification to Shelly’s recipe, and that is the addition of vanilla bean paste. It really amps up the flavor, and it’s a more economical choice than whole vanilla beans. These little beauties bake up so fluffy and soft, and they can be filled or topped with all sorts of deliciousness. But today, I kept it simple with another “Simply Perfect” recipe: Vanilla Swiss Meringue Buttercream. It’s a little more effort than the straight-up powdered sugar + butter variety, but the satiny-smooth, light-as-air, yet richly indulgent flavor and texture make it more than worth your while! 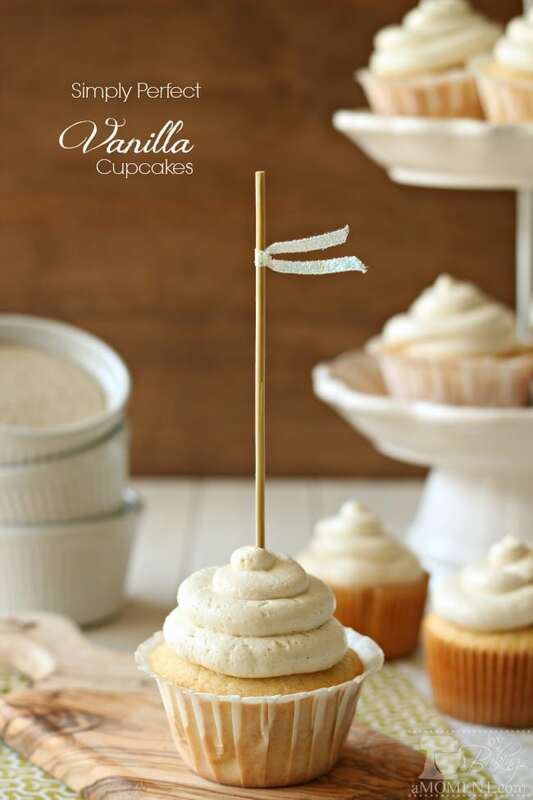 These Vanilla Cupcakes will be your absolute Favorite! So Fluffy, with an Intense Vanilla Flavor and Buttery Richness. They have a Fine, Even Crumb, and a Perfect Dome on top! They are Sturdy enough to stand up to all sorts of Fillings and Frostings, but I've kept it Simple with a Vanilla Swiss Meringue Buttercream. You'll reach for this Recipe again and again! Place the flours, sugar, baking powder, and salt in a mixing bowl and stir to combine. Add the butter and mix on low speed, until mixture resembles coarse crumbs (2-3 minutes). Add the eggs, one at a time, and scrape the bottom of the bowl to make sure all the ingredients are well-combined. Combine the milk and vanilla in a measuring cup. Beat half this mixture into the flour/butter/eggs. Beat on medium speed for 1½ minutes, scrape the bottom and sides of the bowl, add the remaining milk mixture, and beat for another 30 seconds. Fill paper liners ⅔ full with batter, and bake for 20 minutes, or until a tester inserted in the center of the cupcake comes out clean. Cool completely before topping with buttercream. Place the egg whites and sugar in a mixing bowl. Set over a pot of simmering water, and whisk continuously, until the mixture is hot, opaque, and the sugar is completely dissolved (should not feel gritty between your fingers), about 5 minutes. Whip the mixture on high speed, until stiff peaks form and it has completely cooled. Add the butter, a tablespoon at a time, whipping well after each addition. If it begins to look curdled, continue to beat until it comes back together, before adding the remaining butter. Mix in the vanilla until well blended. You are going to love these simple, sweet cupcakes! Sometimes the simplest pleasures can really be the best. Not everything needs to be fussed around with, right? And that goes just as much for sugar as it does for cupcakes. If you like things simple, unfussed around with, and natural, then you’ll definitely enjoy Zulka Morena Pure Cane Sugar. I have not been compensated by Zucarmex (the makers of Zulka), but I was given a sample of their product to review. All of the opinions expressed in this post are my own. Visit www.zulca.com or the Zulka Sugar Facebook page, for more great recipe ideas. I love posts like these that share tried and true recipes. 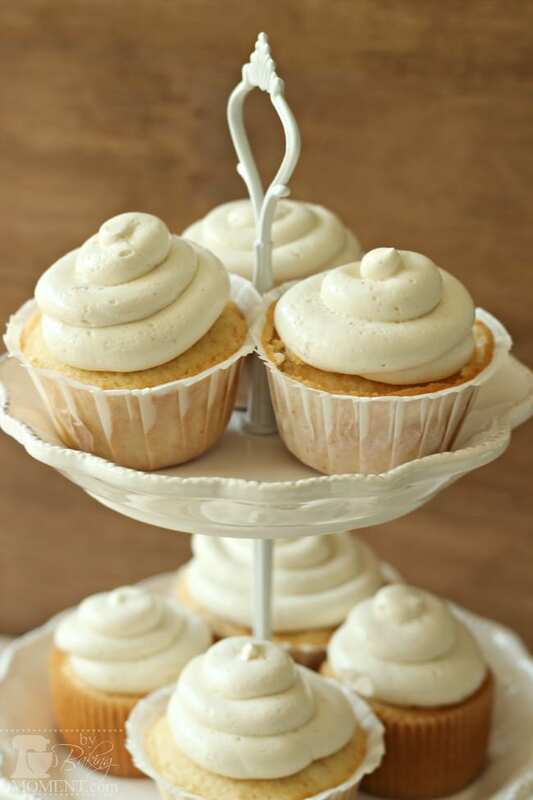 I am always on the quest to find that perfect vanilla cupcake and these look absolutely beautiful Allie! 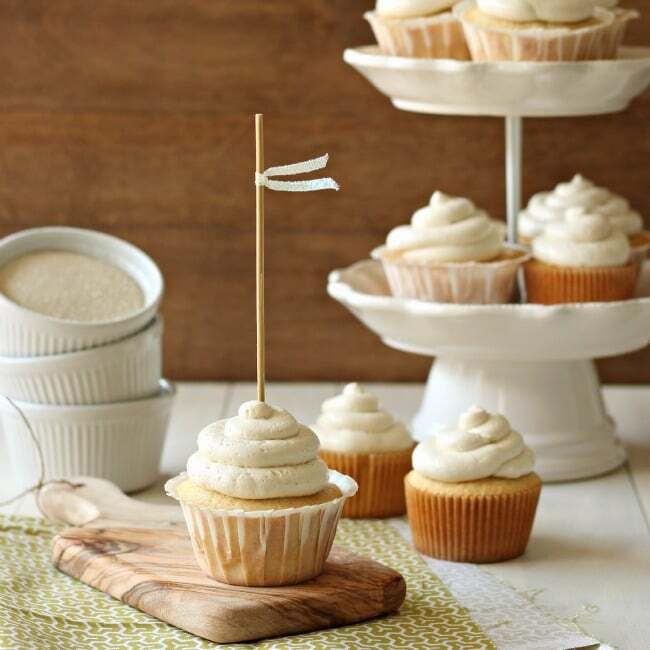 I have tried a lot of vanilla cupcake recipes too and my favorite so far has been Jamie’s. I haven’t tried Shelly’s version but will definitely be pinning this recipe the next time I make a batch. They sound incredible! Thanks so much for sharing Allie and have a great weekend! No they don’t seem to crack and I’ve made them a number of times as close as last Thursday for my niece’s birthday party. I usually use buttermilk in place of milk and watch closely at 14 minutes to check for doneness as I notice they tend to bake up pretty quickly in my oven (even though I use an oven thermometer). Oh, ok! Thanks for getting back to me on that. I will have to try making them again, maybe it was just a one-time thing. I did really love the flavor and texture of that recipe… Hope you’re having a great week! I use plain flour only and, because I use jam in these cupcakes, I don’t use any vanilla 🙂 – blimey, I spelled “convenient” wrong! These cupcakes are simply beautiful. I love how classic and pure the flavors are and also umm…I wanna dive headfirst into the frosting! Hi , i’m Mun Mun . can you tell me how measuring the butter ? Hi Mun Mun! It’s just a cup of butter in this recipe, in other words, 2 sticks, or 230 grams. These are so beautiful! Sometimes, you just need to stay simple, and these look perfectly executed. Who doesn’t love a good, fluffy vanilla cupcake? Yum! These cupcakes look like absolute perfection! I’ll take a dozen, please! hi, just looking at your cup cake receipe can you confirm the amounts of cake flour and all purpose flour, is it one and a half cups or is it half a cup. One and a half cups each, as stated. Thanks for reading! It’s because I live in the Netherlands and I really don’t know which one of them you use. You have a beautiful blog, though! Hi, Sarah! Well I am in the U.S. and we I used a liquid measuring cup for the milk, and a dry measure for the flour, sugar, etc. A liquid cup is 8 ounces, which is 237 ml (just googled it, lol!). I hope that answers your question. These look absolutely amazing Allie! That icing looks pretty incredible too 🙂 Pinned! When I make cake or cupcakes, they’re usually chocolate, but it’s nice to know this vanilla recipe is perfect! What tip did you use to frost these? I love these shots! Hi Loretta! I usually do chocolate too, or something a little crazier/more inventive/interesting, but I thought this was a great basic recipe and I just had to share it! It’s good as is, but I figured it could probably be easily modified too. Glad you enjoyed; thanks for commenting! Hey! I love love love your site!!! Just found it today. I am making these tonight and I was just wondering how many cupcakes this makes? 12 or 24? Hey Lexi! Thanks for the sweet compliment! This recipe makes 2 dozen cupcakes, so 24. Good luck, I really hope you enjoy! Hi, you mention that you add in half of the wet ingredients before beating, but you never mention the other half of the wet ingredients. Do you add them after the first minute and a half in the mixer, after you scrap the bowl? How should these be stored? Room temp or in the fridge? How long can they be stored? Thanks! I just made a batch of these cupcakes and they tasted delicious! I could really taste the strong and rich vanilla flavor. However, the top of my cupcakes were slightly burnt while the inside of them were exactly like the picture. They taste moist and fluffy. Was it due to my oven temperature that got the top burnt? Hey Jasmine! Thanks so much for reading my blog and trying one of my favorite recipes! I’m so glad you liked the flavor, but sorry you didn’t get exactly the result you were hoping for. I have a few ideas as to why the tops may have overbrowned. 1) The best place to bake anything is in the center of the oven. Move the racks around if need be. Place a rack in the center of the oven and place your cupcake pan right in the middle. This way the hot air can circulate evenly, 360 degrees around whatever it is you’re baking. 2) Your oven temperature could be off. Sometimes ovens will show a certain temp, but really, it could be as much as 50 degrees off in either direction! I keep a thermometer in my oven, so I can be sure that I’m baking at the right temperature. This kind of thermometer can be purchased for $15 or less at most supermarkets. 3) One of the best baking tips I’ve ever heard is to watch your cake, not the clock. < --This is Averie Sunshine's mantra (http://averiecooks.com), and girlfriend knows what’s up. I often set the timer 5 minutes less than a recipe calls for, and I bake with the oven light on. If the timer goes off and I can see through the glass that they’re still wet looking, I give them another few minutes. If they’re starting to look more set up after that, I’ll crack the door and check them with a long skewer. (Just be careful not to let all the heat out of the oven or your cake could collapse!) Still gooey? Another minute or two. Take them out when the skewer comes out dry, or, preferably, with a few moist crumbs. They’ll continue to cook a little more as they cool, so it’s ok to take them out just (very) slightly underdone. I hope you find these tips to be helpful! Again, thank you so much for reaching out. 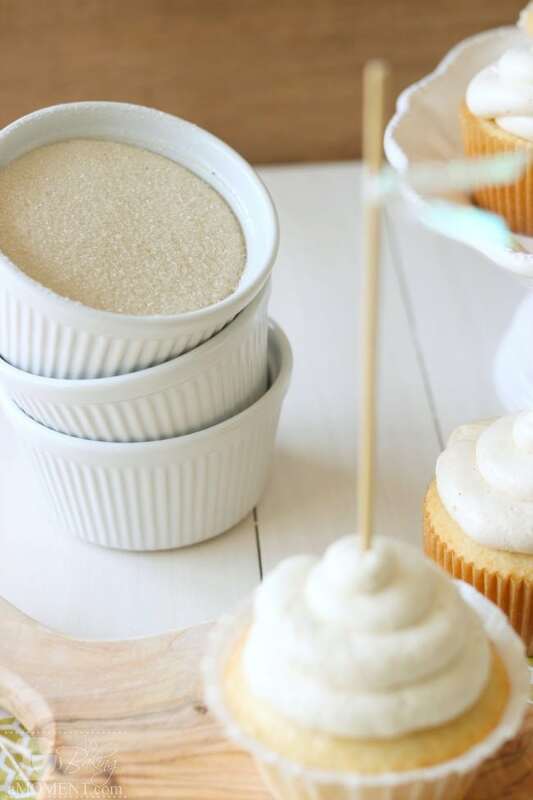 Hopefully your experience with this recipe doesn’t discourage you from trying again, with my favorite vanilla cupcakes or any other of my recipes. Good luck and happy baking, dear! Thanks so much again Allie! I will definitely try them again with the tips you have given! Awesome blog by the way and keep updating us with new recipes! Can’t wait to bake another one of your wonderful recipes! Hi Melody! Thanks so much for stopping by here ;). I’m glad you liked the photos and the cupcake recipe. It would definitely work with vanilla extract. The flavor would not be quite as intense, and you wouldn’t have those black specks, but it wouldn’t affect the texture or anything. I buy my vanilla paste online, and there’s actually a link to my source within the recipe. I love having it on hand, it just bumps everything up to another level! Good luck, and hope to see you here again! I cannot find the recipe for the vanilla frosting. Scratch that, I found it. What kind of milk did you use? Whole? Buttermilk? 2%? I’ve made these cupcakes three times now. Every time I’ve made that icing it comes out too runny, and I have to add powdered sugar to thicken it up. Am I not waiting long enough before I add the butter, and as a result it’s ‘melting’? I have a kitchen aid stand mixer with a glass bowl. Could the glass be keeping the heat from the sugar and egg white mixture longer than a metal bowl would? I the icing tastes great, but isn’t thick enough for frosting the cupcakes. What am I doing wrong? if I’m in a pinch with no vanilla paste can I substitute real vanilla? can you tell me how much your flour weighs per cup? Hi, Kim! I think you might find this chart to be useful: http://www.kingarthurflour.com/recipe/master-weight-chart.html. 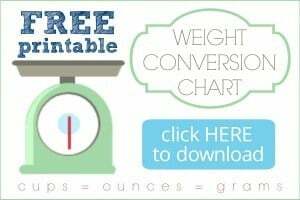 It has weight conversions for all sorts of things, including the all-purpose and cake flours that I’ve called for in this recipe. Good luck with the cupcakes and I hope to see you here again! Could these be used to make mini cupcakes? If so, how long would they cook for? Its the bowl temp that caused the icing to be runny. I made it last night. I had to wait close to 30min for the bowl to be cool. It was worth it. The icing finally came out perfect! These have such a rich vanilla flavour, yum! My problem was they didn’t turn out nice and fluffy like yours. Mine were moist but dense and gummy. Where did I go wrong? I’ve made the recipe a few times since originally posting it, and added some additional direction in the method part. I think it helps if the butter is cool/cold and cut into small cubes. Also, I’ve been adding in the eggs one at a time, and incorporating completely before adding the remaining ingredients. Are you preheating the oven before baking the cupcakes? My oven gives a beep when it’s reached full temp, but if yours does not, you probably want to let it preheat for a good 20 or so minutes, just to be sure that it’s at the right temperature when the cupcakes go in. Hi. Just found this recipe and i will give it a try tomorrow. How can I subsritute vanilla bean paste? I don’t have at home at this time. Hope this turns out good cause I am having a bday party and will be baking reeses peanut butter cupcakes and of course vanilla cupcakes. Just wanted to share that I followed the recipe except fpr the vanilla bean paste cause I didn’t have any and the cupcakes came out so good and moist! I just have a few questions.. In most cupcake recipes I’ve come across, they call for softened butter. Is there a reason why you used cold butter instead? Will it be difficult to incorporate the mixture? Are you using a stand mixer for this, or a food processor? Also, would you need to beat the mixture thoroughly after each egg addition? Hi Ida! Please, do not be sorry! I love comments and you’ve raised some really excellent questions. I’ll do my best to answer them all! You are right, most cake recipes call for creaming the butter and sugar first, and then adding dry and wet ingredients alternately. This is a completely different method. It’s called the reverse creaming method, and I personally love it because I find it quicker (don’t have to wait for the butter soften) and easier (less bowls to wash). If you google “reverse creaming method,” I’m sure you’ll see that it’s a thing 😉 I first became aware of it through Rose Levy Berenbaum, author of the Cake Bible, and I’ve also seen it done on Brown Eyed Baker, Cookies and Cups, and Sweetapolita blogs. I use a stand mixer, but I’m thinking a food processor might work well too. I don’t think it’s difficult, you just want to be sure that the mixture looks like breadcrumbs. If you overdo it, you’ll have cookie dough, if you underdo it, your batter will look lumpy. That being said, I’ve done both, and the cupcakes still taste pretty darn good to me. 😉 I do add the eggs one at a time, beat just until incorporated, and scrape the bottom/sides of the bowl after each addition, to make sure everything’s well-incorporated. Hi Sarah! I usually use either Swan’s Down or Softasilk. If you click the link within the recipe card, it’ll take you to a mail-order source. I don’t believe it contains any leavening agents. 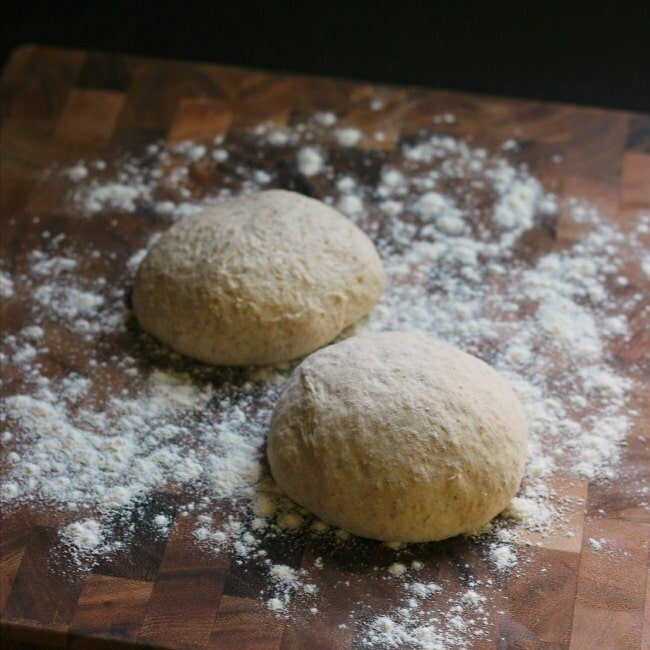 It’s just a very finely milled flour from hard winter wheat, that’s naturally lower in glutens. There’s baking powder in the recipe, as I’m sure you already noted. I’m so happy you’re going to try my favorite recipe! I think you are really going to love it! I’ve made it so many times now, and it’s always a big hit. Good luck, dear! Is this vanilla flavored buttercream as stable as the chocolate smbc like u mentioned? Yes, absolutely. It’s dreamy! I think you’ll love it Kris. Thanks so much for reading and I hope you’re having a terrific weekend! Vanilla extract will work, but you just won’t get those little black specks and the flavor will be a bit milder. It will still be delicious though! Did you try clicking the link within the recipe? I usually purchase it through that mail-order source. Maybe they don’t deliver outside of North America, I’m not sure, but it’s worth a try! I love the stuff. And yes, the recipe should cover all your cupcakes. Good luck! Thank you for the recipe. I just tried it. The taste is awesome but it seems the flour did not rise so the consistency was very heavy and like it wasn’t done in the middle. What do you think I did wrong??? Did I mix it too long??? Thank you in advance for your advice!!! Hi there! Thank you so much for reading my blog and trying one of my recipes! I’m so sorry you didn’t quite get the result you were after. But I am glad that you took the time to reach out to me because I think I may know what the problem was. No, I don’t think mixing too long would cause this problem. I actually believe the problem may have been with your baking powder not being fresh. Baking powder does have a shelf life, and after a while, it is no longer effective, so your baked goods will not rise properly. One other possibility may have to do with your oven. If it wasn’t properly preheated (I’d give it 15-20 minutes), or if it’s not well calibrated, you could end up with a less than perfect result. It’s important to always check your cakes with a toothpick or skewer. If it’s gooey, it needs more time in the oven. If it comes out with moist crumbs, it’s perfect. Hi, just have to say OMG these cupcakes are amazing!!! I’ve made 4 batches so far on different days. First time I had the same problem, with the cupcakes being heavy and looked like it hadn’t cooked through the centre..but the outside was perfect. I tried on another day, but kept them in the oven for 4-5 mins longer or until they had a golden colour on the top, and not so much white. They were perfect!! Fluffy and taste amazing. Thank you so much!!! Never thought I’d come across a percent vanilla cupcake, that taste way better than the ones from the shops! I’m so happy you like them so much, Sarah! And thanks for bringing up an excellent point- not all ovens are exactly the same, so you really do have to test, and see, before taking them out of the oven. Thanks so much for sticking with it! And for the awesome feedback. I love these cupcakes too and I’m so happy they’re working out for you! Thank you Allie for your advices. My mom and a friend said it might also be the flour!!!! At any rates, I have tried again tonight and am anxiously waiting to see how these come out. I took the “ugly” ones to the office and everyone loved them… So I can only imagine what it would be like when they are done perfectly!! I will let you know for sure. Thank you also for responding so quickly! Hi Rachel! I have a feeling either sugar would probably work well, although I’m leaning towards caster sugar since you said that is typically for baking. I’m not familiar with Trex; I just use regular unsalted butter. The brand I generally buy is Keller’s. Good luck with the cupcakes and thanks so much for reading my blog! Hi ive since tried the recipe using granulated as called for and I found on sweetapolitas site her recommendation for making cake flour(since we only have self raising/plain here) and the cakes have turned out almost omelette like on top(all bubbly and eggy smelling) and inside it looks dense and partially cooked 🙁 any ideas?? Hi I used the combo and baked for stated time. baking powder is fresh still 🙁 the taste ive gotten used to but I was sooo desperate to have the close crumb/soft spongy texture 🙁 I don’t know what went wrong either. I’m so sorry you didn’t get the result you were after. The only thing I can think of is maybe your oven temp might be a little off. Every oven’s a little different, I’m sure you know, and that is why I always give a rough baking time and then also a description of how it should look before taking it out of the oven. I check my cupcakes after about 18 minutes with a long skewer, and if it comes out wet, they go back in for 2 more minutes or so. I don’t take them out until there’s nothing but a few moist crumbs on the skewer. Averie Sunshine, a very talented baker and popular blogger, always says “watch the cake, not the clock.” I actually just made a batch of these this afternoon, I wish I could share them with you! Looking forward to trying this recipe for my son’s 3rd birthday this weekend! One question: I don’t have vanilla bean paste, but I have a vanilla bean. Could I use the vanilla bean instead and, if so, how would I do so? Steep the bean in the milk, strain, and continue with the recipe? Thanks so much! I used this recipe to make red, white, and blue cupcakes for the forth of July last year. They were PERFECT. This is definitely my favorite vanilla cupcake recipe. Thank you soo much for posting it! I really dislike that you have video ads on your blog. I understand this is a form of income for you, but it comes across as very crass and desperate. Very nice recipe. I wrote it down so I no longer have to deal with the annoying video ads. Thanks for your input, Sarah. I’m glad you enjoyed the recipe. I devoted many hours to developing it, photographing it, and writing about it. I’m so happy that I can offer it to you free of charge. Please feel free to use the printable recipe card I have provided to you, also free of charge. You are welcome to comment on my blog at any time, but I do ask that you refrain from insults. Along with the considerable amount of time I invest in my website, there are many expenses as well. Running an ad or two helps to offset those a little bit. I do my best to keep them as inconspicuous as possible, and yours is the first complaint I’ve ever received. Most of my readers are grateful for the content I am providing them with, and they understand that ads are common practice among blogs and websites in general. I am sorry for my post but I could not but react to that post. Thank you for your videos and pictures… they help me and guide me in my process of learning the art of cupcakes. You are doing an awesome job!!! You are most welcome Allie! ;0) Keep up the good work! I could not help but react to your post. If you dislike the way Allie shares her beautiful recipes but are soooo willing to use HER recipes, at least have the decency to be polite on her blog. I find your post very rude and offensive… but obviously, you have no manners. Made this for my friends birthday (I halved the recipe) but it came out really dense and not fluffy at all 🙁 any idea what could’ve gone wrong? There are so many different factors that go into the success or failure of a cake. It’s hard for me to say exactly what went wrong without being beside you in your kitchen, but some of the most common issues are: the oven could be out of calibration, the baking powder may not be fresh, they may be slightly underbaked… I think if you take a moment to read through some of the other comments on this post, you will find some more helpful info on this topic. Great recipe! I tried these and they turned out great with the frosting. One issue i had, and not sure if you’ve ever had it or can help diagnose, is that without the frosting they tasted very eggy. If you can understand what I mean by that. Not sure if my eggs were too large – i bought large eggs, but not larger than normal – or if something in my technique caused it. Any help is appreciated! 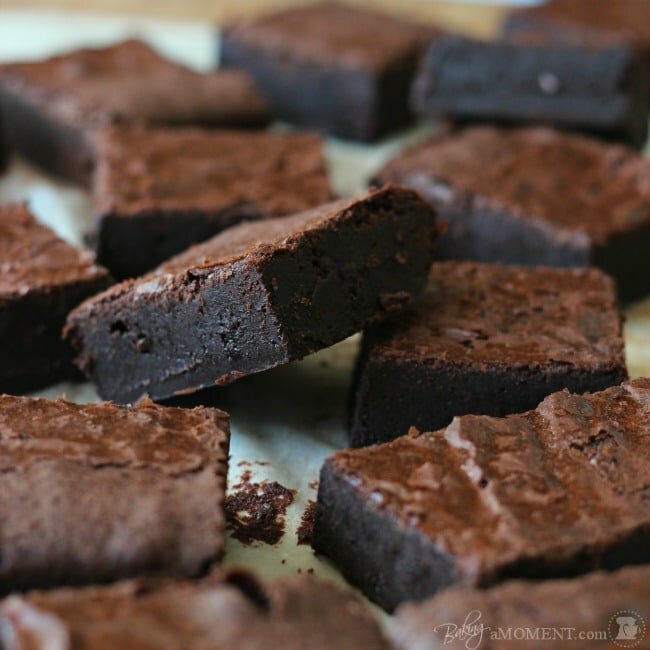 Btw, the simple chocolate recipe was TDF (to die for)! Thanks! Yay! I love the chocolate too- my FAVORITE! Hi Maggie! I’m so happy you enjoyed the recipe! I’m not sure about the eggy thing… I haven’t had any other readers mention anything like that. I think you did the right thing- I always use large eggs for baking. So, I’m sorry but I’m really not sure! I’m so excited to try this recipe after your trial to find out which recipe seems best! I know many people think vanilla is boring, but I don’t think it is when it’s done right, and hopefully it’s a safe choice for a variety of preference since I don’t know the bride’s family at all. Fingers crossed I can find the vanilla bean paste today because I’m dying to try that instead of regular vanilla extract. Even if I can’t find it locally I’m definitely buying some later to have on hand. I’ll definitely report back to let you know how the cupcakes turn out! Congrats to your brother, Diana Lee! That’s so exciting. I think vanilla/vanilla is a perfect way to celebrate a wedding, especially when you go the extra mile to do everything from scratch. I think your friends and family will really enjoy this. I’m told that the vanilla bean paste is sold at Williams Sonoma and Sur la Table, but if you can’t get it at either of those places, there is a link within the post to an online mail order source. It’s a great ingredient to keep on hand for all sorts of uses; I just love it! Good luck and thanks for reading! 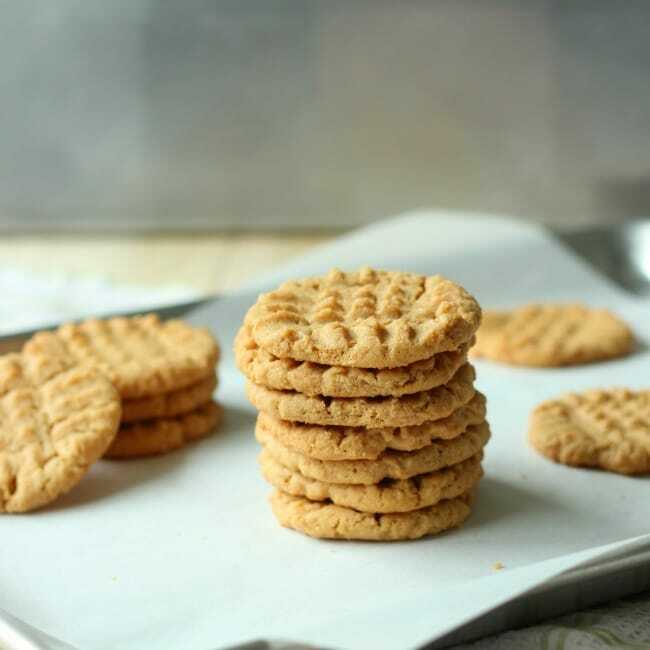 Hi – so I made these today bc I fell in love with yours, however they were a tad doughy … I wonder if i use 100% cake flour if that will lighten it up? Or sift both flours before adding? And perhaps bake longer? Hi Sweet tooth! I’d definitely bake a bit longer- if they’re doughy they probably need more time in the oven. If you stick in a skewer or toothpick and it comes out gooey then bake for a few extra minutes and then check again. Every oven is a little different, y’know? They aren’t done until the toothpick comes out clean. Thanks, and good luck! Hi~ I made these cupcakes today and the cake was delicious, perfectly moist and crumby. I need help with the buttercream frosting though. It turned out very heavy and thick, not silky at all. They still tasted amazing, but I wasn’t able to pipe them. Suggestions? Thank you Melissa! I’m so happy you liked the cupcakes, and appreciative for your readership and that you tried one of my recipes 🙂 I am so, so sorry about the buttercream though! I cannot imagine what went wrong?!? Swiss Meringue Buttercream is my favorite, for sure, but some people don’t like it because it’s less sweet or just a little different and unfamiliar. But I have never heard of it coming out so thick that it can’t be piped. I really wish I could offer some solution but I really am stumped! I’m so sorry dear! i really love your website . I have tried your chocolate cupcakes and they were so delicious. TQ for all the recipes. I wanna ask u about this vanilla cupcake recipe..can i use the recipe for my rainbow cake or ombre cake?previously i used the doris green white party cake. Hey Rafidah! Thanks so much for reading my blog and trying my recipes! 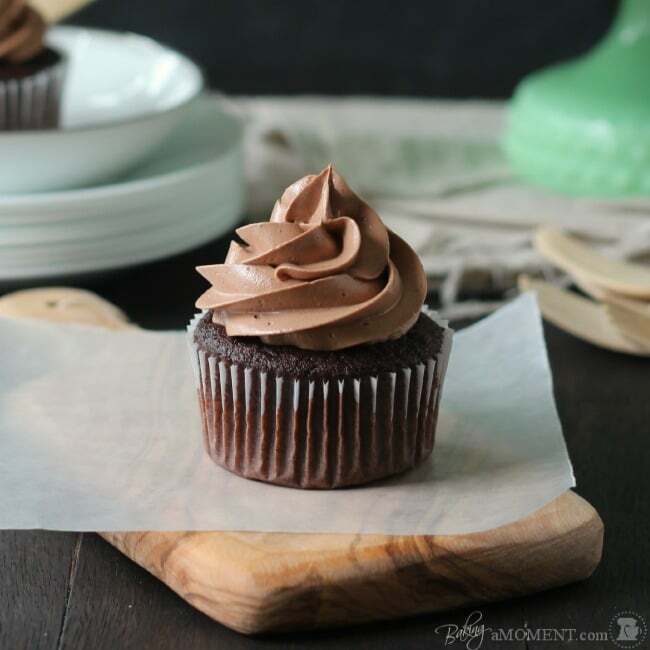 The chocolate cupcake recipe is one of my absolute favorites, if not my very favorite, recipe. I really like the vanilla cupcake recipe too, but I will admit that I’ve had some readers who had trouble with it. I would urge you to read through the comments on the post, and judge for yourself. I don’t really now enough about your rainbow ombre cake to tell you for certain, but I will say that I found the vanilla cupcakes to be really tasty and easy to make! The chocolate cupcake recipe, I thought you said you’d tried it…??? Sorry I guess I misunderstood. It’s this one: https://bakingamoment.com/simply-perfect-chocolate-cupcakes/. So SO good, and all my readers love it too. I’ve yet to hear a bad word about these babies! I hope you enjoy and do let me know how the ombre cake works out for you! I’d love to hear about your experience. 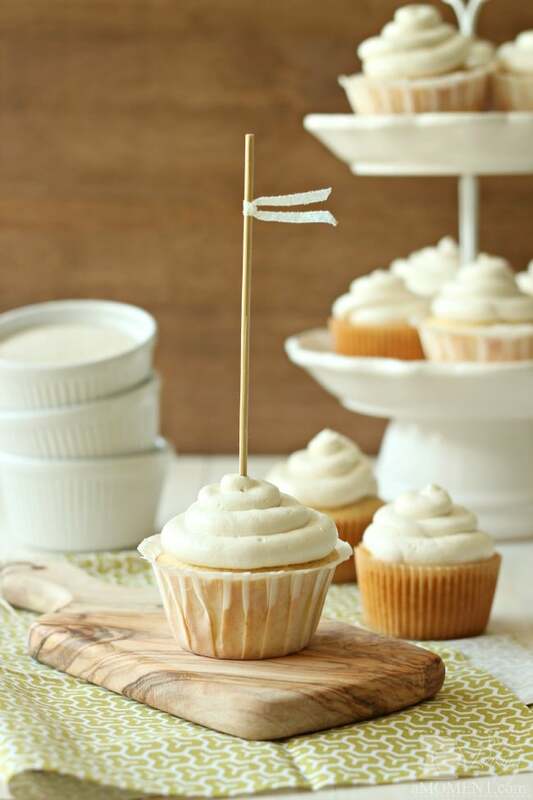 I’ve finally found a go to vanilla cupcake recipe and frosting – thank you! One question though, why do you add your butter in cubes & cold? 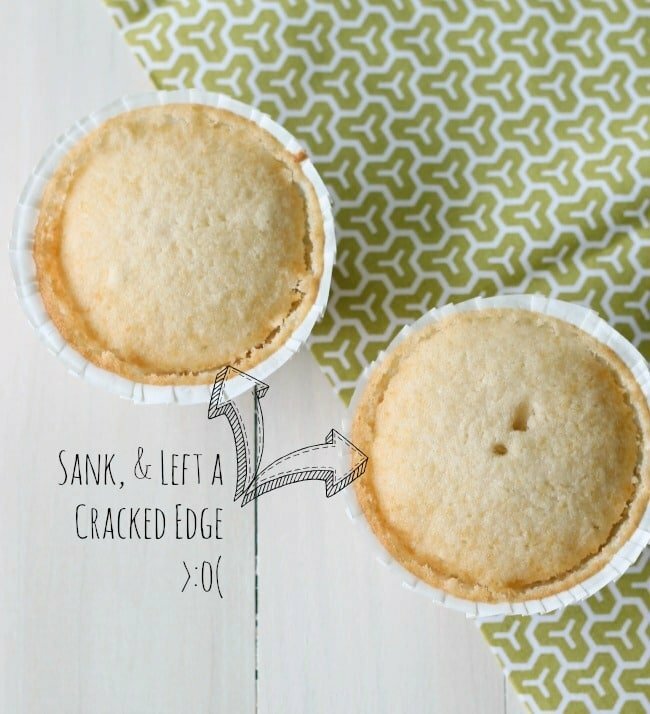 I do this for my scones and other more dense pastries where I want to make them more airy and ‘fluffy’, but I’ve never heard of doing this with cupcakes, especially ones using cake flour. I must admit, that was my variation from your recipe…I creamed the butter, then added in the sugar until it was light and fluffy, added the eggs one at a time, and then, alternating, added the flour mixture with the milk/vanilla mixture. They came out absolutely divine – very light and just a beautiful flavour. I’m curious to try your method, but I’m so used to creaming the butter and sugar when I bake cupcakes that I’m not terribly interested in changing this either. Will be curious to hear if you’ve made this recipe using both methods and what differences you see between the methods. Hi Julie! I’m so happy you like these cupcakes as much as I do! And glad to know that it works equally well with the traditional creaming method. I had not tried doing it that way, although I do often use that method for many other recipes. This method has been dubbed the “reverse creaming” method and I really like it, just for its ease. You can read more about it here: http://bakeoutsidethebox.blogspot.com/2012/09/the-reverse-creaming-method.html. I’ve actually gone back and forth between using cold butter and softened butter and I truthfully can’t decide which offers better results. But I really do love the reverse creaming method because it’s so foolproof and just one bowl to wash! Lol… Thanks for the great question, Julie! Hi!!! I just discovered your blog and I loved it … I will try more than one of your recipes. Thanks for publishing. I have a question, I live in Madrid, Spain and I don´t know this kind of cake flour. Can I use any other brand of cake flour? Hi! I made this recipe this morning, but I used frozen sliced peaches that I had leftover from peach season here in Michigan. I thawed the peaches and put them in a strainer while I was preparing the other ingredients. Then I roughly chopped up the peaches (actually it was more like crushing them because they were so soft) and then I added them to the batter. They turned out great! Very peachy! It was nice to bring back a little bit of summer considering we have been stuck in a never-ending winter. opps! I meant to post this on the peach muffin recipe! Hi! I’m from Singapore and I just tried this recipe today. The cupcakes fluffed up after about 25 mins but when it cooled, it sank and was quite dense even though the flavour was really good. I’m unsure if I had underbeaten it as it was quite runny when I scooped the batter into the cupcake holders, or was it underbaked? And did you use a paddle attachment to beat the batter? Thanks! Hi Grace! Thanks so much for reading my blog and trying one of my recipes. I did use the paddle attachment. I think perhaps your cupcakes may have been underbaked. Every oven can be slightly different, and different altitudes can play a part in baking as well. Don’t pull the cupcakes from the oven until the tops spring back when pressed, and a toothpick inserted in the center comes out clean. Thanks again and good luck! 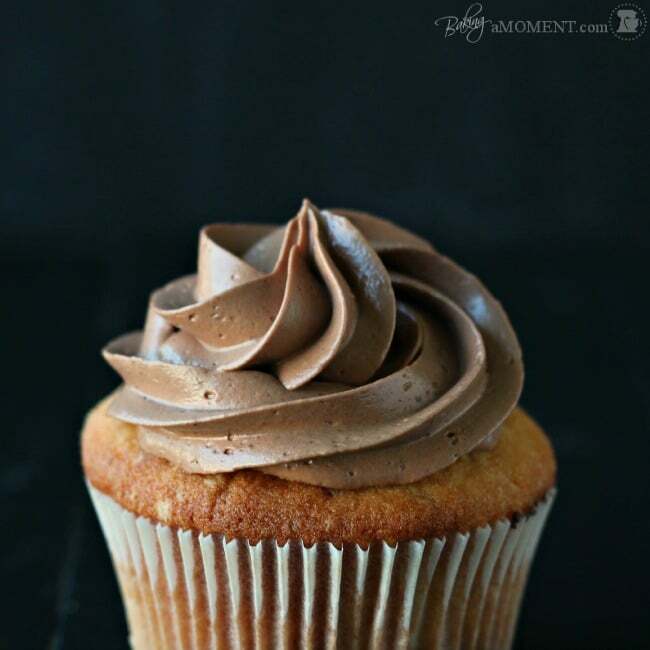 Hi Allie, your chocolate cupcake is now my go-to recipe, now I’m off to try this vanilla cupcake recipe. I checked out Shelley’s site too and noticed the modifications you’ve done to the recipe, i.e, cold butter vs. room temp, equal amount of cake flour and APF vs. 1 3/4 cup cake flour and 1 1/4 cup APF, and lastly 1 1/2 cup milk vs. 1 cup. If you don’t mind, I just want to know the reason behind these modifications and what would be the difference in the outcome between the two. Also, if I use vanilla bean instead, do I still need to add some extract? Hi Allie, I followed your advise and adapted the Lemon Greek Yogurt Cupcake recipe (sans the lemon juice and zest) and they were indeed delicious! It is now my go-to vanilla cupcake recipe! I halved the recipe as I wanted to see first if I can make it by hand (can’t use the mixer as the baby was napping). I just used a wooden spoon and spatula. I was actually surprised that I was able to achieve the coarse crumb consistency with just a wooden spoon! And no, I don’t have strong biceps. I just mixed it slowly, gently mashing the butter with the wooden spoon so it incorporates with the flour. Quite cathartic actually. I think mixing it by hand also helped as I tend to over mix when I use a stand mixer. The cupcakes turned out moist, light, fine crumbed yet sturdy. So yes, you can do the reverse creaming method by hand, just make sure all ingredients are room temp. Can’t thank you enough for ending my quest for the perfect chocolate and vanilla cupcakes! That’s so great, Grace! I’m so happy you had such a great experience, and thank you so much for sharing it! So good to know it can be made easily without a mixer. Thanks for the great feedback, dear! Hi I’ve made these cupcakes before with great results. Lately, they bake up fine with great domes on them while they are in the oven, and once they cool they sink down into the wrappers. They are nothing at all like the pictures. Any ideas as to why this is happening? Tee, I’m going to edit the recipe a bit. I’ve gotten similar comments from other readers, and I think it might help if the milk is decreased a bit. Also, I think if you allow the butter to soften before adding it to the dry ingredients, you might have better luck. I’m sorry for the trouble! I will actually be posting a new (and I think better) recipe for vanilla cupcakes in the coming weeks. It’s basically this: https://bakingamoment.com/lemon-greek-yogurt-cupcakes-with-cream-cheese-frosting/ but without the lemon. It’s really reliable! I too had the problem of them puffing up too much and then collapsing. The still tasted wonderful, jsut didn’t look good. I’m sure I didn’t underbake them, ad I actually had them in about 7 minutes longer than was suggested. And they were browning on the top. The toothpick came out totally clean. I don’t know what I did wrong! they don’t have cake flour here in the UK so I was making it myself – for every cup of cake flour, do 1 cup of all purpose and replace 2 tablespoons with corn flour. Not sure if I didn’t measure properly. I also didn’t do totally exactly measurements for the baking powder. Would a little tiny bit extra make that difference? The were still yummy and once frosting was on them, they were great, but would just like to improve them for next time. Thanks!! Awesome recipe! I’d love to use for my friend’s party. Is there any way to half the recipe? Thanks Steven! I’m so glad you like this recipe- but if I may I’d love to direct you to this one: https://bakingamoment.com/even-simpler-more-perfect-vanilla-cupcakes/. It’s even better, IMHO! And yes, it halves beautifully; I do it all the time 😉 Good luck and enjoy! Followed your instructions to a tee. They are absolutely beautiful and yep, simply perfect! Filled them with vanilla pudding and covered them with a chocolate ganache. Boston cream pie cupcakes! Thank you! Can I use the same ratio to bake a 2 layer cake with 9 inch pans? I am trying to make a birthday cake. Thanks! Hi Arthi! I have not tried it myself so I can’t make any guarantees. I would think you’d probably need to double the recipe though. Good luck and I hope it works out! Hi! I wanted to use this recipe to make a 2 layer 9-inch cake. Will this recipe make that? Or do I need to double the recipe? Thanks! Hi Arthi! This recipe produces a little over 4 cups of batter. According to this chart: http://www.wilton.com/cakes/making-cakes/baking-serving-guide.cfm, I’m thinking you’ll probably want to double the recipe. I haven’t done this myself so I can’t guarantee the results, but if it works well for you I’d love to hear about it! I’d be so appreciative if you’d drop me another comment here and let me know. Good luck! Thanks for your reply! I finally followed the recipe from your Even Simpler Cupcakes and tripled the recipe… which I think was a mistake as my layers ended up being too tall….. I think I would have preferred this as a cupcake – everyone loved the taste – so that was great!. Thanks! Oh ok! I wonder if maybe just double would have been better. Glad you liked the taste though! Thanks for the feedback, Arthi! hi love your recipes…just wanted to know can i use buttermilk instead of milk to make my cupcakes moist and last a little longer….will it work? Hi there! I just made these today and while I thought they were tasty, the kids did not like them! Much to my dismay, of course. I came here because of the simply perfect chocolate cupcakes, which everyone gobbled up like they were going out of style! I was hoping the vanilla (as one of the little ones doesn’t really like chocolate) would go over just as well. I think the problem was the “buttery flavor”, perhaps they turned out a little too rich for the young paletes. The texture, as deservingly celebrated in previous posts, was fantastic, but I found the cupcakes to be more rich than sweet. Hey there! I’m so sorry your kiddos didn’t like the flavor but I’m glad the grownups did! 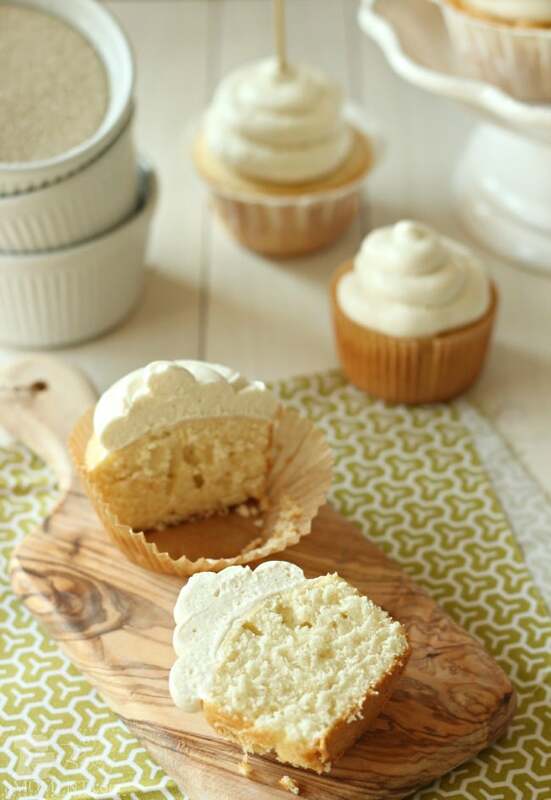 If you’re looking for something a bit sweeter and less rich, definitely check out my White Cupcakes recipe: https://bakingamoment.com/white-cupcakes/. I just posted it yesterday, but it’s already a huge favorite around my house! Hey Alexandra! I’m so glad you liked them on the test run! I would not advise making the batter the day before, however. The baking powder will poop out before they hit the oven and you’ll end up with pancakes! If you want to do a little prep ahead of time, you could just measure out the dry ingredients and set them aside for a bit, but the minute you add liquid to that the leavening starts activating. Another option would be to bake the cupcakes, cool them, and freeze them unfrosted. I do that a lot! Hope that helps! I tried these yesterday, and while it’s very moist, I can’t really taste the vanilla; neither could my wife. I followed the recipe exactly. Do I increase the amount of vanilla, and if so, which one, the liquid or the paste? Please answer. You could absolutely increase either or both and it would not affect the chemistry of the recipe at all. Hope that helps; good luck! I am really excited to try vanilla bean paste – I’ve never used it before. I really love buttercream icing – and ther swiss meringue is the kind I usually make. The recipe I’ve used calls to switch from the whisk to a paddle after the icing is complete. Beat for 2 minutes or so at slow speed to smooth out the icing and get rid of air bubbles. I have a paddle attachment with a spatula blade, and this works really well. Great tip Jennifer! Thanks so much for sharing! So glad you enjoyed them Noura! Thanks for the great feedback! I have made these a number of times and they are delicious, they also dome beautifully if you start your cooking at 200C for about 6 minutes and then reduce it to 170C for the rest of the cooking time. My question is that I have a brilliant Red Velvet Cupcake recipe but they will not dome, can I substitute some flour for the cocoa and will the introduction of the colouring gel effect the way this recipe cooks and still get the lovely dome that this vanilla cupcake recipe produces? Hey Patricia! I’m so happy you like this recipe! I’m not 100% sure about making it into red velvet, but I do have a red velvet cupcake recipe that I absolutely LOVE! It’s moist and full of flavor, with less food coloring than what is typical and it domes very nicely. You can find it here: https://bakingamoment.com/red-velvet-cupcakes/. Hopefully you’ll love it as much as I do! These and your chocolate ones are my go to cupcake recipes, simply delicious. Do you have a simply perfect white cake recipe? Or how can I adapt for two 9 in. round cakes? Hey Amy! You can find my favorite white cupcake recipe here: https://bakingamoment.com/white-cupcakes/. And any of these recipes can be adapted for use as a layer cake. You’ll just want to adjust the bake times as needed. Also, I like to lower the oven temp to 325 so they bake up a little flatter. Good luck and enjoy!